As the highly anticipated Coca-Cola Christmas advert graces television screens for the first time in 2013, it is worth investigating the purpose of advertising for the lead player in the soft drinks market. Despite recently dropping below Apple and Google in terms of brand valuation, according to Interbrand, Coca-Cola is the third biggest global brand, with an estimated value of $79.2 billion. The traditional view of the purpose of advertising is to persuade someone to buy a product that they have never bought before, built upon Elias St. Elmo Lewis’ marketing communication tool, AIDA (Awareness, Interest, Desire, Action). Lewis’ view of an effective advertisement is one that grabs the Attention of the consumer, Interests them to continue reading and subsequently convinces them enough by creating a Desire for the product. In doing this, the suggestion is that the consumer is more likely to take the Action of purchasing when the opportunity arises. If the sole purpose of advertising is indeed to guide consumers through the first three stages of the AIDA Model, it begs the question why a brand with a logo that is recognised by 94% of the world’s population has an annual advertising budget of $2.9 billion? In more recent years, alternative theories have emerged which look beyond generating awareness and instead describe so called ‘weak forces of advertising’. A quick look at the ongoing battle between Coca-Cola and Pepsi provides an interesting insight. Coca-Cola Classic retains the title of most popular individual beverage in the world (18.6% market share), but is not too distantly followed by Pepsi-Cola (11.9%). A study by the Baylor College of Medicine in Texas even found that the two are nearly identical in terms chemical composition, yet preferences exist amongst consumers based on ‘cultural messages’. 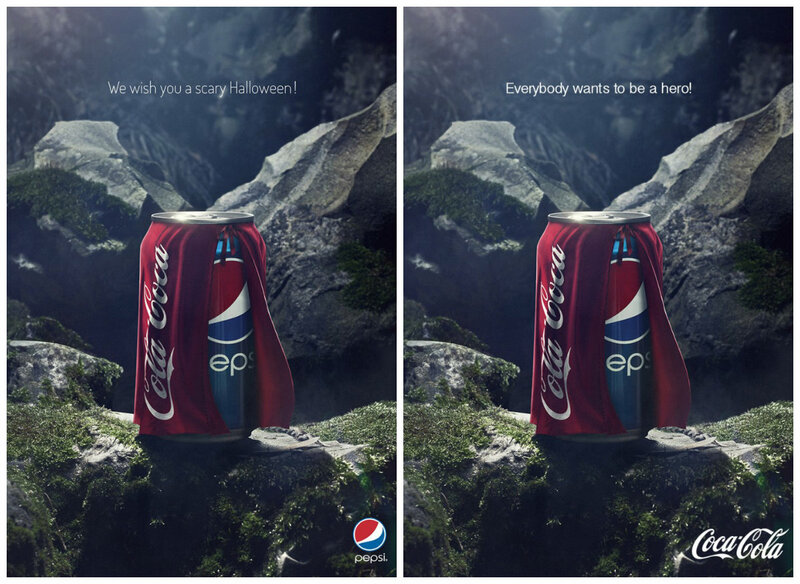 Looking beyond the use of advertising to keep Coca-Cola at the front of consumers’ minds when thinking about buying a soft drink (and the odd advert that takes a cheap dig at the competition, such as the below example from Halloween 2013! ), this study illustrates the importance of creating brand associations. If you were to ask a number of people what comes to mind when they think of Christmas, there is a likelihood that some of them would say Coca-Cola or the Coca-Cola Christmas advert. The reason for this can be explained using the concept of classical conditioning, which has enabled Coca-Cola to intentionally create a pairing between the festive period and the brand. In the mind of consumers, Christmas (unconditioned stimulus) is likely to create positive emotions of happiness, excitement and family (unconditioned response). On the other hand, before conditioning takes place, Coca-Cola (neutral stimulus) does not create any emotions, since no brand associations yet exist. However, by combining Christmas and Coca-Cola in the famous television advert, the positive emotions of happiness, excitement and family re-emerge, to the extent that when Coca-Cola is subsequently displayed alone (conditioned stimulus), these emotions persist (conditioned response), thus creating a brand association between Coca-Cola and Christmas. Whilst the measurement of advertising effectiveness is a controversial issue in marketing, Christmas-period sales of £185m for Coca-Cola goes some way to demonstrate the effectiveness of classical conditioning, especially when the mince pie and turkey markets only accounted for £52m-worth of sales apiece! 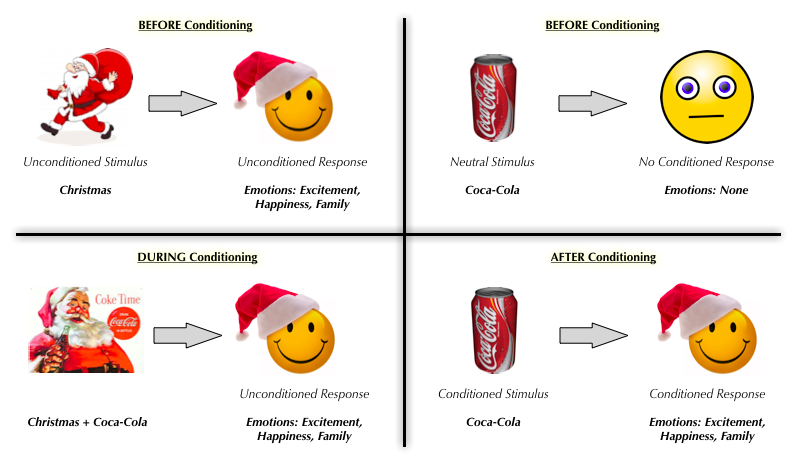 This entry was posted in Branding and tagged Advertising, Christmas, Classical Conditioning, Coca-Cola, Marketing, Pepsi. Bookmark the permalink.